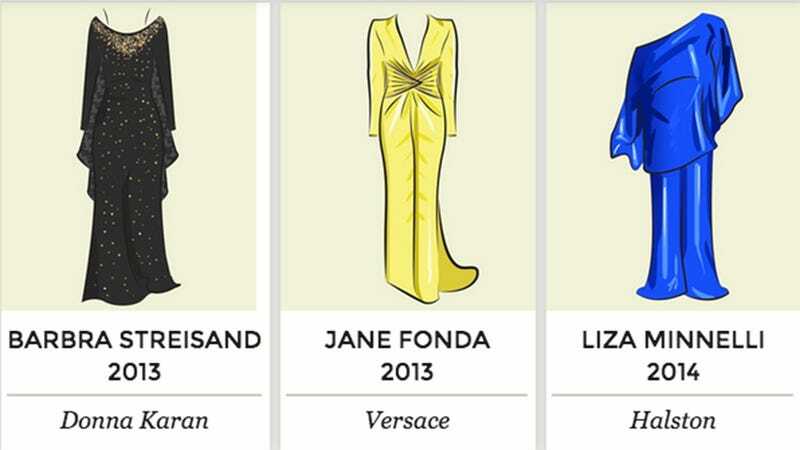 Last Year, Big Group gave all of us something special right before the Oscars: A beautiful infographic featuring (almost) all of the beautiful gowns worn by Best Actress winners since 1929. This year they've updated it, made it interactive and featured more Meryl, which is basically what all of us wanted anyway, right? We selected actresses that had won Best Actress Oscar, appeared at least 7 times at the awards and over a period spanning decades. There are some actresses who couldn't quite make the cut due to time and budget (sorry, Sandra Bullock) but I hope to add more at a later date. What we do have are 17 actresses, 155 outfits and 46 designers, all for you to select, filter, arrange and zoom in on. Enjoy! Also, check out last year's version, which is still one of my favorite things on the internet aside from videos of hamsters eating burritos.